What Else Can I Expect From an Online Master's in Management Program? 'Management' is a catch-all term for administrative leadership roles in private companies and corporations, government agencies and nonprofit organizations. Regardless of their specific workplace, management professionals occupy three different organizational tiers. 'Senior managers' include presidents and vice presidents, chief executive officers (CEOs) and other top-level executives that develop strategic goals for their organization and evaluate overall employee performance to ensure these objectives are met. Middle managers typically oversee one of their organization's branch or regional offices. And lower managers -- such as supervisors or team leaders -- are responsible for select groups of their organization's personnel. Students who graduate with a master's degree in management will leave school prepared for a wide range of top-level managerial jobs. Management is a highly popular field of study for graduate students in the United States. Many students pursue Master of Business Administration (MBA) degrees with a management specialization. According to a 2016 survey by Poets & Quants, 8.6% of male MBA students and 7.2% of female MBA students chose 'general management' for their specialization in 2015-16. Most MBA programs are designed for students with at least two or three years of experience working in the corporate sector; comparatively, many colleges and universities offer Master of Science (M.S.) in Management programs geared toward students that have little to no professional experience. A growing number of MBA and M.S. in Management programs allow students to focus their studies on niche areas of this field, such as human resources, marketing or operations management. Many of today's grad students are choosing to earn their master's degree in management online. Most web-based management degree programs follow the same rigorous curriculum as their brick-and-mortar counterparts, leading to the same number of employment opportunities for successful graduates. The asynchronous (or self-paced) schedule and convenient study-from-home format of online learning is also conducive for students with part-time jobs, childcare responsibilities and other commitments that may interfere with on-campus learning. Learn more about what you can do with an online master's in management and what kind of career opportunities you can look forward to with this comprehensive guide. Will an Online Master's in Management Program Provide Me With the Skills I Need to Advance My Career? Master's in management online programs prepare students to take on supervisory roles in a wide range of workplace settings. The curriculum often incorporates topics such as organizational development and psychology, behavioral science, decision theory, human resources and project management. Many online management master's programs culminate in a capstone project, allowing students to demonstrate the skills and knowledge they have gained as part of a comprehensive, research-based presentation. Internships are widely available; these onsite opportunities enable students to receive supervised training from experienced management professionals. Will an Master's in Management Program Work With My Schedule? Online master's in management degree programs offer a flexible, easily accessible alternative to traditional college education. Students can download course lectures and readings, participate in virtual discussions with other students, submit written assignments, take exams and communicate with their professors from the comfort of their personal computer. Current technology also enables them to study away from home using a laptop, tablet, smartphone and other Wi-Fi-compatible devices. For added convenience, online management master's students can usually coordinate internship opportunities at sites that are reasonably close to their current residence. What Jobs Can I Get With My Master's in Management? Students who leave school with a master's in management will be qualified for a wide range of top-level roles. The majority of these graduates will go on to pursue careers in the corporate sector. Others lead non-business organizations like nonprofits, government agencies, healthcare facilities and educational institutions. Some of the most common occupational roles for management master's recipients include top executives, financial managers, marketing directors, project managers and supply chain managers. What Are the Best Online Master's in Management Programs? Choosing a program is an incredibly personal decision, and only you can properly evaluate whether a target school's strengths match your educational needs. The following ranked list of schools should serve as a helpful starting point in your search for the best online master's in management programs in the United States. If you are considering an online master's in management, be sure to contact admissions specialists at different colleges and universities to learn more their about specific requirements and offerings. UNC at Chapel Hill offers an online MBA in three different management-specific concentrations: global supply chain management, investment management, and management consulting. The MBA@UNC is repeatedly ranked among the nation’s best online master’s in management programs, offering self-paced curriculum that can be completed in 18-36 months. Courses are accessed through the 2NC platform, designed to deliver content in a social-networking-inspired virtual learning environment. The 2NC platform also provides students easy access to organizational support tools, UNC alumni groups, and the school’s exclusive mobile app. Electives within each of the management concentrations incorporate a global approach to business strategy, market analysis, and project management. Students must satisfy 66 credit hours, including a hands-on “immersion” experience, to complete the master’s in management online. On-campus and online courses are led by the same nationally recognized faculty. USC offers an online master of communication management. The MCM degree at USC Online has a global focus, and prepares students to develop and manage marketing, advertising, and PR strategies in all areas of international business and commerce. Courses are delivered using a combination of synchronous and asynchronous methods through the lynda learning platform. In addition to having access to online libraries, a comprehensive career center, and IT/Web services, USC Online students may also enroll in the school’s health insurance program. Comprised of nine courses totaling 32 credit hours, the online master’s in management also requires completion of two two-part capstone practicum courses, in which students are asked to solve a communication crisis within their organization by presenting potential solutions through collaboration with their cohorts and instructors. UF’s master’s in management online prepares students for a career “behind the scenes” of the professional sports industry, involving management of individual athletes, athletic teams, or other sports-related organizations. Courses are delivered in both synchronous and asynchronous formats through several eLearning platforms. Featuring an online registration system, bookstore, and tuition-payment center, UF also offers extensive placement services through its Gator CareerLink site, as well as 24/7 tech support for distance learners. In addition to core courses in sports management, students are required to complete a graduate internship, advanced practicum, and professional development capstone project. Students may choose to further concentrate their study of sports management through one of two optional specializations, in sport law or athlete performance and development. UF also offers an elective in managing collegiate athletes, as well as a semester-long research project option, according to individual student interest. Lehigh University offers two degree options for students interested in an online master’s in management: an MS or master of engineering (MEng) in management science and engineering. Courses in the MS program are primarily comprised of mathematics, computer science, business, and economics, while the MEng program provides practical engineering management and design skills over scientific research. Coursework in each program is designed to build both technical and career skills involving risk analysis, decision-making, logistics, and global supply chain management. Distance students access courses through Drupal content management system. Drupal also provides students with access to online library services, IT/tech support and the LehighULive mobile app. Students must satisfy 24 and 30 credit hours for the MS and MEng programs, respectively. The MS degree requires completion of a thesis project, supervised by a faculty member within the department, while the project is optional for MEng students. Carnegie Mellon offers a master of science information technology (MSIT) with a distance track option in information technology and management. The program is considered among the nation’s best online master’s in management programs, consecutively ranked the No.1 information technology & management degree by US News & World Report since 2005. Distance courses are delivered through Blackboard for this part-time online program, with three points of entry each year. The Blackboard platform also provides access to library databases, online bill-pay systems, and technical support. Distance students are required to complete a total of 144 course credit hours, comprised of core, elective, and approved transfer and independent study courses. In addition to the variety of elective courses offered within the School of Systems and Management, students may also enroll in select courses available through the School of Computer Science for the MSIT distance degree. Those enrolled in online programs at Carnegie Mellon are eligible to attend commencement events with fellow students on campus in June. Brandeis University offers an online master’s in project and program management. The MSPPM comprises interdisciplinary courses in business, operations, management, technology, and leadership. Specifically, students learn project management, budget management, communication, and negotiation skills, applicable in both public and private sectors of business. Courses are completed by cohort groups of no more than 20 students, allowing for personal attention from instructors renowned in their field, who are also trained specifically in online education. The virtual learning environment also provides access to an online bookstore, library, and resource center designed for distance students. Electives within the online master’s degree in management include management of global and virtual teams, social media and collaboration technology, and other special topics. Students must complete a total of 10 10-week courses, including seven required and three electives, to earn the degree. The program offers three points of entry throughout the academic year. Northeastern offers an online MS in project management through its global college of professional studies. The online master’s degree in management at NEU addresses four career-oriented program objectives: specialized knowledge, broad and integrative knowledge, civic learning, and intellectual skills. Courses are delivered through the Blackboard platform, with support from Smarthinking online tutoring system, Collaborate web conferencing and Voice Tools technology. Online curriculum at NEU is designed to be adaptable to various learning styles, available through both live streaming, interactive presentations, and printable PDF formats. In addition to core and elective curriculum in project management, students are required to complete an intensive capstone project to round out foundations courses in this major. Students majoring in project management may choose from eight concentration areas, including construction management and geographic information systems, both of which are exclusive to the online program. GW’s online master’s in management includes a unique concentration: political management. While rooted in concepts traditionally found in both political science and public policy programs, the online master’s degree in management focuses on a practical, rather than theoretical, approach to global issues. The 36-credit-hour program promotes an “applied politics” model, in a non-traditional, non-partisan learning environment. Courses are accessed through the Blackboard platform. Online students can also access a variety of self-help resources and academic support services with a single login through the school’s GWeb Information System. In addition to core and elective requirements, students may opt to complete their capstone project through a residency on-campus in Washington, D.C., where they can gain hands-on experience in the birthplace of American democracy and politics. The curriculum in the online program mimics on-campus courses, exploring campaign management, issues management, and advocacy and political leadership. NYU offers an online MS in management and systems with four optional concentrations: database technologies, enterprise risk management, strategy, and leadership and systems management. Coursework in the online master’s degree in management provides an advanced understanding of the intersection of traditional business and leading-edge technology skills. Courses are delivered through the school’s own NYU Classes learning management system, with the help of Big Blue Button, a virtual meeting tool. Through NYU’s ServiceLink portal, distance students can access 24/7 tech support, pay bills online, and find virtual tutors and other resources, all in one place. Core courses address complex information management systems, business strategies, and assessment techniques using the latest technology. Students are prepared for senior-level positions within an IT department or technologically advanced organization. In addition to completing seven core courses, students must select four courses within their area of concentration and at least one elective course, as well as complete a capstone or thesis project. For full-time students, the program may be completed in as little as two years. BU offers online master’s degrees in management in six subjects: applied business analytics, banking and financial services, insurance, international marketing, project management, and risk management. A concentration in IT project management is also available through a master’s degree in computer information systems. Courses are accessed through Blackboard, with additional help from virtual interactive tools and programs including Smarthinking and Student Link. Online students can access library and bookstore resources, online advising, tech support, and student account information in one place, through the BU Login portal. Though coursework varies according to major, BU’s online master’s degrees in management typically require a combination of core and specialization courses, often with additional graduate-level courses required, though the majority of majors do not include a capstone or thesis as part of the online program. Most distance degrees can be completed in 24 months or less. Among the nation’s best online master’s in management programs, U.S. News and World Report has consistently ranked BU offerings within the top 10 in their respective fields. NCSU at Raleigh offers an online MBA with five management-focused concentration options: biosciences management, innovation management, financial management, marketing management, or supply chain management. NC State’s online master’s in management requires two three-day residencies on Raleigh’s main campus, though this requirement can be waived for active-duty military students. Course content is delivered asynchronously through the use of podcasts and multimedia web presentations, completed by students grouped into cohorts, or virtual teams. Online courses are taught by on-campus professors, offering academic support to distance learners via phone, email, or online chat during their virtual office hours. In addition to core and elective courses, students are required to complete an intensive practicum course in a special topic, in accordance with their area of concentration. Those interested in an accelerated program may complete the online master’s in as little as 21 months, while part-time students may take up to six years to complete the degree. University of Texas at Austin offers an online master’s degree in management with a focus in engineering. UT’s engineering management program combines traditional MBA curriculum with technical career skills that are specific to the field of engineering. Specialized coursework allows students to build a foundation in subjects including economics, marketing and analysis to affect efficiency and productivity in the workplace. The online engineering management program and UT’s Cockrell School of Engineering have been recognized as one of the top ten in the nation, and number one in the state, respectively, for ensuring quality, accessibility and affordability among engineering programs. Courses are delivered through the Canvas platform. In addition to having access to training services, an interactive calendar and full-service tuition-payment options online, students in the engineering management program have their own IT sub-site to provide technical support. Online and on-campus students take the same classes, in real time, via a synchronous viewing option for remote participants. Villanova University is one of the few schools nationally to offer an MS in church management. The unique master’s in management online is designed to build the advanced leadership skills needed to pursue high-level positions within a church, ministry, parish, or religious order. The specialized degree offers fully integrated curriculum that approaches modern business and management concepts from a faith-based perspective, focusing on four primary competencies: planning, controlling, organizing, and leading. Courses are accessed through the Blackboard platform. Through the MyNova portal, online students can access the Help Desk, as well as academic support tools and personal account information. Curriculum comprises 30 course credit hours, and the program may be completed in as little as 24 months. Distance students must complete a one-time, one-week residency to start the program, however, the remaining coursework can be completed entirely online. Webster University offers an online master’s in management and leadership through the Walker School of Business and Technology. Distance students may pursue an online MA in management and leadership, or choose a management and leadership concentration within the online MBA program. Online degrees are also available in seven additional unique management concentrations, including environmental management, procurement and acquisitions management, and space systems operations management. Courses are accessed asynchronously through Canvas and the school’s WorldClassRoom portal. Webster’s dedicated Online Learning Center provides distance students with support resources including academic advising, orientation services, and library access. Electives within the management and leadership program explore business strategy, leadership skills, and integrated studies in organizational behaviors. Students must satisfy 37 or 49 course credit hours for the MA or MBA program, respectively, comprising both core and elective courses within the major. Online courses are available in eight-, nine- and 16-week formats, and programs may be completed in one to four years, depending on full-time or part-time status. Texas A & M offers an online MS in sports management. Here, the online master’s degree in management emphasizes fiscal, personnel, and administrative management skills, as well as sports marketing and sales, within the athletics industry. Courses are delivered through Moodle, eCampus, and eLearning platforms. The highly-trained staff within the school’s Office of Digital Learning Technologies works alongside instructors to develop innovative online courses and maintains support resources for distance students, including an IT Help Desk, academic advising opportunities, and a financial services team. For distance students in the sport management program, curriculum consists of research core, sport management core, elective, and field experience courses, however no thesis project is required to complete the degree. Both part-time and full-time students are welcome to apply to the online MS in sports management program. USD offers an MS in supply chain management. The online master’s in management at USD is ideal for professionals with experience in one or more specialized areas of supply chain operations who are seeking executive-level advancement in the field. The program is ninth in the nation, according to U.S. News and World Report, for its engaging learning environment and personalized student experience. Courses are accessed through Blackboard. Through the student portal, distance students can also access a variety of virtual support tools including 24/7 IT help, an online job board, and a USD mobile app. Online management courses are rooted in practical application of business and leadership skills, and taught by instructors with extensive field experience. Curriculum requires completion of an “integrative project,” rather than a final thesis. Coursework is completed by cohort groups of 22 to 25 students, encompassing online courses with the exception of five required campus visits during the course of the degree. ECU offers several different majors for students interested in pursuing a master’s in management online. Options include a master of construction management (MCM,) an MS in health informatics and information management, and an MS in technology management. Additionally, a concentration in computer network management is available to students enrolled in the online master’s degree in network technology. Courses in construction management stress the advanced leadership skills, quality control measures, and legal knowledge needed to pursue large-scale construction planning and development. Majors related to health informatics and information management and technology include technical coursework that explores complex data systems, virtual information structures, and classified database training. Distance courses are delivered through Blackboard and Centra eLearning platforms, and may be synchronous, asynchronous, or a combination of the two methods. Online coursework mirrors on-campus programs, and is taught by the same experienced faculty. The Naveen Jindal School of Management at UT Dallas offers an UT at Dallas offers an online MBA with over 10 concentrations with business analytics, finance, healthcare leadership and management, information technology management, marketing and supply chain being the most popular. Though not required, students are encouraged to select one to two areas of concentrated study. Courses are accessed through Blackboard, with additional support tools including academic advising, career services, tutoring labs and satellite library services available through a single login on the eLearning portal. The MBA is a 53 credit hour program that can be completed by enrolling in full-time course loads or part-time. Students must complete the program in 72 or fewer months. The school also offers a STEM Master’s in Management Science which is a 36 credit hour degree. The Naveen Jindal School of Management at UT Dallas is recognized among the nation’s best for its graduate business programs, according to recent rankings from U.S. News and World Report. John Wesley University offers an online MS in business administration in organizational leadership. The master’s in management online explores business strategy, entrepreneurship and innovation and global management techniques. Additionally, the program incorporates a specialization in sustainability, with courses in the management of environmental resources, ethical and social issues and sustainable growth. Courses are accessed through the Canvas platform. Canvas also provides access to integrated third-party support tools, A/V plugins, and social media networking through one, consolidated login screen. JWU students can also access coursework using the exclusive mobile app. The MS in management and organization comprises a total of 30 course credit hours, combining management core courses, business electives, and advanced electives. Students may choose from general advanced electives, or opt for electives within one of 11 available specialization areas. Online and on-campus courses are taught by the same renowned faculty, with years of experience in the fields of management and sustainability. University of St. Francis offers an MS in management, designed to build advanced leadership skills in five primary areas: critical thinking, communication, managerial use of information, supervisory abilities, and the human side of management. The online master’s degree in management offers entry points during fall, spring, and summer semesters, and may be completed in as few as 15 months. Courses are delivered through Canvas, which also provides access to 24/7 tech support, career counseling, academic advising, and other services available through the Academic Resource Center (ARC.) Distance students may be eligible to earn academic credit for job experience, as well as pursue graduate certificates, bridge programs, and/or dual degrees in a concentration area within management. Students must satisfy 36 credit hours in a combination of core and concentration courses. The university has consistently ranked among the nation’s best online and graduate programs, as well as earned numerous additional awards, according to U.S. News and World Report. Michigan State’s online MS in management, strategy, and leadership builds core skills in five primary areas: strategy, human resource management, leadership, decision-making, and team management. Curriculum is designed to inspire leading-edge, outside-of-the-box application of management and leadership concepts, with accelerated courses that allow students to maximize their course-load while still graduating in as few as 20 months. MSU Online courses are delivered through live stream or as downloaded media files via Bisk Education technology, accessible on any computer or mobile device. Distance learners may also access student support tools including 24/7 tech support, live chat tools, and faculty-hosted discussion boards through the University-Alliance portal. Program electives incorporate a global approach to international business management, negotiation and conflict, and other special management topics. Students must satisfy 15 five-week courses to complete the online degree. 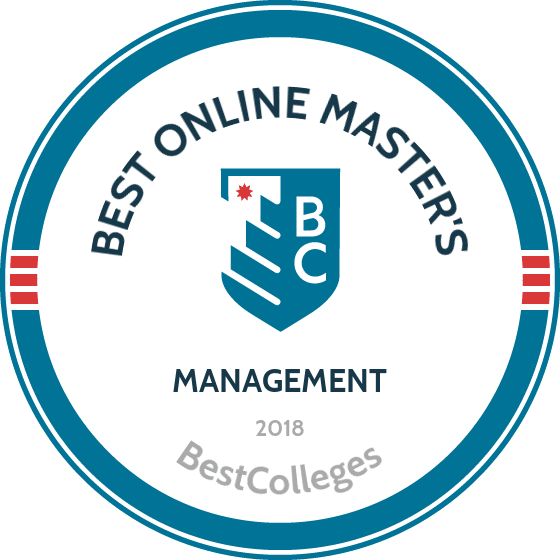 Recently, the MS in management, strategy, and leadership was recognized among the nation’s best online master’s in management programs by both HR.com and U.S. News and World Report. NJIT offers an online MS in management in three concentrations: business analytics, global project management and Web systems and media. The MSM is ideal for professionals transitioning into management and seeking technical experience in their respective concentration area. Courses are accessed through Blackboard, with additional student services provided through the NJIT Highlander Pipeline portal. The portal also provides access to interlibrary loan services, online study groups, and academic advising. The master’s in management online curriculum encompasses 30 course credit hours in two modules: business core and management concentration. The business core explores key concepts including accounting, finance, marketing, and more. Due to similarities between the two programs, graduates of NJIT’s online MSM degree within the last three years may be eligible to earn an MBA by completing only 30 additional credits. UCF offers online master’s degrees in several different areas of management, including engineering management, hospitality and tourism management, and nonprofit management. Courses in each program require a combination of core, concentration, and elective courses, as well some form of practicum and/or final project. The MS in engineering management is available in a thesis or non-thesis format, and the nonprofit management degree includes a leadership certification option. Online master’s in management courses are accessed through LyndaCampus. The virtual learning environment also provides access to student support tools including a 24/7 virtual career center, software and skills training, academic advising, and more. Students must satisfy at least 30, 33, and 36 credit hours, respectively, to complete the engineering management, hospitality and tourism management, and nonprofit management degrees online. Online and on-campus courses are led by the same experienced faculty, many with terminal degrees in their respective fields. Syracuse offers an MS in information management through its School of Information Studies (iSchool,) ranked nationally for providing one of the best online master’s in management programs by U.S. News and World Report. MS coursework approaches information studies from an interdisciplinary perspective, with courses exploring data science, cybersecurity, human-computer interaction and more. Courses are accessible through iSchool’s exclusive online learning management system on any computer or mobile device. Online students are assigned their own admissions counselor to help guide their study; additional student support services available through iSchool include library access, academic study groups, and personal advising opportunities. Distance students may choose one of two available study tracks: a 30-credit executive MS in information management or a 42-credit MS degree, which may be completed in as few as 15 and 21 months, respectively. Graduates of iSchool programs are welcome to attend the commencement ceremony on campus with their Syracuse University peers in May. UNL offers an online business administration MBA in five specialization areas: business analytics, finance, supply chain management, international business, and marketing. The online master’s degree in management was recently ranked among the nation’s top MBAs by U.S. News and World Report and The Financial Times. Courses are delivered asynchronously through Blackboard. Extensive academic support for UNL students in distance programs includes career counseling, library and bookstore access, and student account services. The 48-course-credit-hour online MBA encompasses 30 credit hours of core courses and nine credit hours each of electives. While full-time students may complete the degree in as little as 1.5 years, most students graduate in three to four years. Upon admission into the program, students may enroll beginning in the fall, spring, or summer terms. How Long Is an Online MBA Program? Due to the high demand for qualified professionals in corporate leadership roles, the employment outlook for management degree-holders is quite favorable. The following table lists unemployment rates for some of the most common management-related occupations. All of these roles were included in the 'Best Business Jobs' list published by U.S. News & World Report in 2016. Of the six professions listed on the table, the average unemployment rate is 3.4%. By comparison, the national unemployment rate for all industries is currently set at 4.6%. In addition to strong job security, students who graduate with an online master's in management also enjoy higher earning potential during the early career stages than their bachelor's degree-holding counterparts. The table below looks at entry-level salary expectations for bachelor's and master's graduates with management degrees, as well as the wage premium for those with a master's. As the table indicates, master's graduates with degrees in all seven fields outearned bachelor's degree-holders by at least 17% during their first five years in the workforce. However, career salary growth expectations will depend more on specific job titles that master's degree fields of study. The next table examines 20-year salary projections for five of the most common management-related professions. All five occupations listed on the table reported a career salary growth rate of at least 21%. Marketing managers saw the highest growth: a 45.8% increase in earnings between the entry-level and late-career stages. Operations managers placed second with 44.5% salary growth after 20 years in the workforce, followed by supply chain managers with 38.4%. Students who graduate with an master's in management will be qualified for dozens of top-level positions, although individual eligibility will depend on additional factors like company size and city/state of employment. Four of the most common career pathways in professional marketing are detailed below. These managers are responsible for leading campaigns that promote different goods and services. These campaigns involve various types of activities, including product giveaways, consumer surveys and other promotional materials, as well as billboards, web banners and other advertisements in print, digital and online media. In order to develop effective campaigns, they often collaborate with designers, artists, sales representatives, financial analysts and other personnel in other departments. These employees (also known as HR managers) are tasked with managing the administrative activities at companies and organizations. Their day-to-day duties include recruitment, interviewing, screening and hiring of new employees, as well as assisting employees with workplace issues and mediating organizational conflicts. These managers create goals for sales teams and evaluate employee progress to ensure these objectives are met. They may also develop training programs and professional development modules for their personnel, and manage tasks related to organizational finance and budgeting. Executives develop strategies and productivity goals for their personnel, and then coordinate programs and initiatives to ensure these objectives are carried out. They are also responsible for recruiting and hiring middle and lower managers within their organizations. Making professional connections and learning about different approaches to management is crucial to your success. Professional organizations offer a great entry point for students who want to learn more about their chosen career path. Below you'll find three of the country's most prominent organizations established for management professionals. These organizations host networking events, provide online trainings, maintain active job boards, and offer other services for career-ready college graduates. Resources like these often prove invaluable as you complete your degree requirements and prepare to enter the job market. Project Management Institute: With roughly 450,000 members in nearly 300 global chapters, PMI is considered the world's largest organization dedicated to project management. Eight professional certifications are available. Members also enjoy continuing education opportunities, invitations to networking events and discounts on various learning resources and services.